Florida is full of natural beauty if you escape the sprawl and strip malls. Most visitors miss this as they hurry down the interstate focused on their destinations. But if you exit the freeway and slow down, you can begin to sense it. Myakka River State Park; however, slaps you in the face and says ‘Look at me! I’m beautiful!” No special perception required. 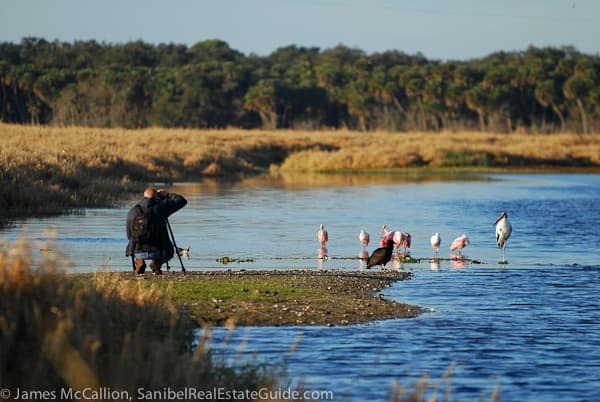 A two hour drive from Sanibel Island rewards you with graceful oaks draped in Spanish moss, thickets of cabbage palms and an abundance of fresh water birds often hard to find elsewhere. In January, our family went camping for two nights along with some friends. Unfortunately, they were the coldest two nights of the season and my summer-weight sleeping bag left me more than chilly (the kids all had better bags thankfully). But as the light of dawn illuminated our surroundings, I forgot my popsicle toes and we enjoyed the gift mother nature presented. Hot chocolate by the fire - It was Chilly! Our family brought bicycles and we rode up and down the paved main road, plus we ventured off onto dirt roads that went deep into the park. Canoeing and kayaking are a major attraction and can be rented at the park. Fishing, hiking and back-country camping are also available. For the less athletic, guided boat and tram tours are also offered.